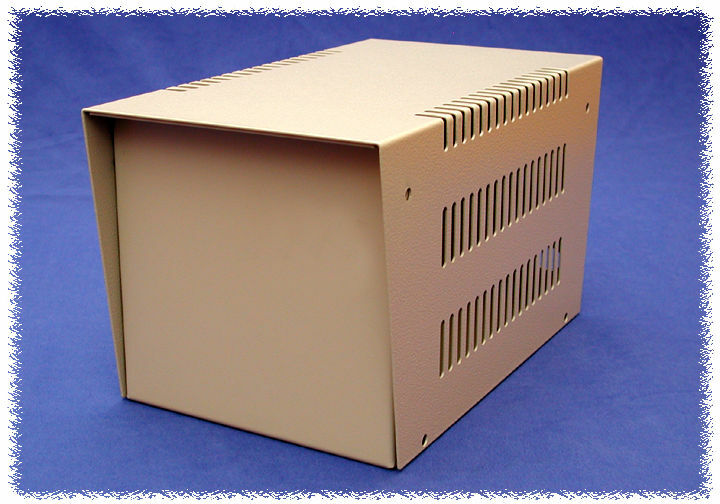 All steel, heavy duty construction designed to house heavy, heat producing items (example...power supplies). Bottom of unit is 16 gauge steel, top is 18 gauge steel. Finished in a rugged, contempra grey, textured powder finish. Top half is of an upside down “U” shape design for easy removal, bottom half is also “U” shaped but includes a fold on all sides including front & back for extra strength and mounting of top case. Top case section is heavily ventilated for excellent air circulation with an attractive slant (also doubles as a lifting area - both front & back). Top lip extends 0.75” (19 mm) on both sides adding 1.5” (38 mm) to the total depth. Bottom is solid except for 4 holes for mounting heavy duty rubber feet.